Later in the article, Max McCalman, also of Artisanal, warns against using dry, crumbly cheeses in fondue. They "don’t melt as readily as smooth, semifirm ones, he said. But, he added, a little bit of acid, like a high acid wine or lemon juice, will do wonders in smoothing out intractable curds." 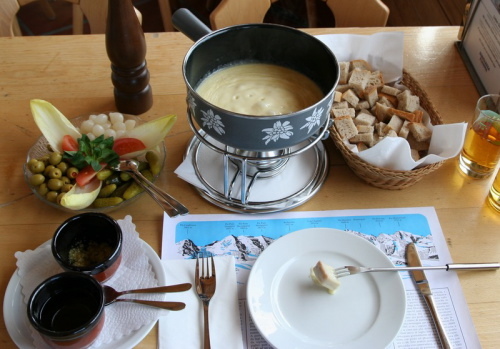 The article also includes some recipes for fondue variations, including a Sweet Gorgonzola Fondue, a Latin-style Queso Fundido, and an Italian Fonduta, made with Fontina Val d'Aosta, milk, eggs, and truffles. Yum!